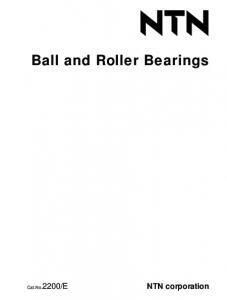 Extra Small and Miniature Ball Bearings are described on Pages B30 to B45. The above temperature range applies to standard bearings. By using cold or heat resistant grease and changing the type of rubber, the operating temperature range can be extended. For such applications, please contact NSK. MAXIMUM TYPE BALL BEARINGS Maximum Type Ball Bearings contain a larger number of balls than normal deep groove ball bearings because of filling slots in the inner and outer rings. Because of their filling slots, they are not suitable for applications with high axial loads. BL2 and BL3 types of bearings have boundary dimensions equal to those of single-row deep groove ball bearings of Series 62 and 63 respectively. Besides the open type, ZZ type shielded bearings are also available. When using these bearings, it is important for the filling slot in the outer ring to be outside of the loaded zone as much as possible. Their cages are pressed steel. MAGNETO BEARINGS The groove in the inner ring is a little shallower than that of deep groove ball bearings and one side of the outer ring is relieved. Consequently, the outer ring is separable, which makes it convenient for mounting. Pressed cages are standard, but for high speed applications, machined synthetic resin cages are used. LIMITING SPEEDS The limiting speeds listed in the bearing tables should be adjusted depending on the bearing load conditions. Also, higher speeds are attainable by making changes in the lubrication method, cage design, etc. Refer to Page A37 for detailed information. PRECAUTIONS FOR USE OF DEEP GROOVE BALL BEARINGS For deep groove ball bearings, if the bearing load is too small during operation, slippage occurs between the balls and raceways, which may result in smearing. The higher the weight of balls and cage, the higher this tendency becomes, especially for large bearings. If very small bearing loads are expected, please contact NSK for selection of an appropriate bearing. Notes (1) For tolerances for the snap ring grooves and snap ring dimensions, refer to Pages A50 to A53. (2) When heavy axial loads are applied, increase da and decrease Da from the above values. (3) Ring types N and NR applicable only to open-type bearings. Please consult NSK about the snap ring groove dimensions of sealed or shielded bearings. B8 (4) Snap ring groove dimensions and snap ring dimensions are not conformed to ISO15. Remarks 1. Diameter Series 7 (extra thin section bearings) are also available, please contact NSK. 2. When using bearings with rotating outer rings, contact NSK if they are sealed, shielded, or have snap rings. Notes (1) For tolerances for the snap ring grooves and snap ring dimensions, refer to Pages A50 to A53. (2) When heavy axial loads are applied, increase da and decrease Da from the above values. (3) Ring types N and NR applicable only to open-type bearings. Please consult NSK about the snap ring groove dimensions of sealed or shielded bearings. B 10 (4) Not conformed to ISO15. Notes (1) For tolerances for the snap ring grooves and snap ring dimensions, refer to Pages A50 to A53. (2) When heavy axial loads are applied, increase da and decrease Da from the above values. Remarks 1. Diameter Series 7 (extra thin section bearings) are also available, please contact NSK. 2. When using bearings with rotating outer rings, contact NSK if they are sealed, shielded, or have snap rings. 3. Please consult NSK about the snap ring groove dimensions of sealed and shielded bearings when the diameter of dimension series 18 and 19 is 50 mm or more. Remarks 1. When using bearings with rotating outer rings, contact NSK if they are sealed, shielded, or have snap rings. 2. Please consult NSK about the snap ring groove dimensions of sealed and shielded bearings when the diameter of dimension series 18 and 19 is 50 mm or more. Note (1) When heavy axial loads are applied, increase da and decrease Da from the above values. Remarks When using bearings with rotating outer rings, contact NSK if they are sealed or shielded. (1) When heavy axial loads are applied, increase da and decrease Da from the above values. 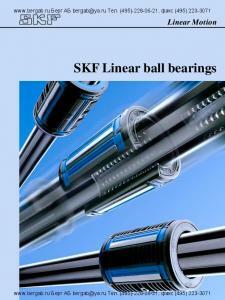 Remarks When using Maximum Type Ball Bearings, please contact NSK. Remarks 1. The outside diameters of Magneto Bearings Series E always have plus tolerances. 2. When using Magneto Bearings other than E, please contact NSK. Please refer to NSK Miniature Ball Bearings (CAT. No. E126) for details. The flange tolerances for metric design bearings are listed in Table 3. 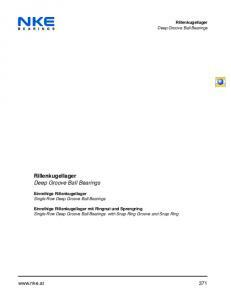 The flange tolerances for inch design flanged bearings are listed in Table 8.8(2) (Pages A76 and A77). Please refer to NSK Miniature Ball Bearings (CAT.No.E126). Remarks Single-row angular contact ball bearings are available besides those shown above. Note (1) The values in parentheses are not based on ISO 15. Remarks When using bearings with a rotating outer ring, please contact NSK if they are shielded. Note (1) The values in parentheses are not based on ISO 15. Remarks 1. When using bearings with a rotating outer ring, please contact NSK if they are sealed or shielded. 2. Bearings with snap rings are also available, please contact NSK. Remarks When using bearings with a rotating outer ring, please contact NSK if they are shielded. Remarks 1. When using bearings with a rotating outer ring, please contact NSK if they are shielded. 2. Bearings with double shields (ZZ, ZZS) are also available with single shields (Z, ZS).